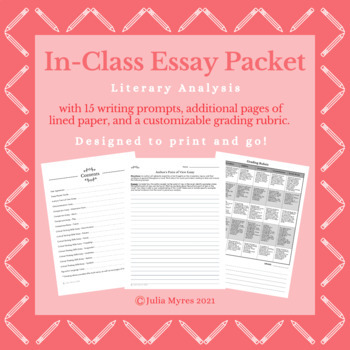 This essay packet has 15 different writing prompts each designed to be paired with a novel. They are laid out with the writing prompt, two pages of lined paper, and a grading rubric with customizable scoring. All you need to do is pick your writing prompt and press print! Recommended use is for 6th-12th grade. The design is simple, but professional so it will not distract the students as they are writing. If you would like to request a custom prompt, please let me know. I will get it to you within 48 hours for a small fee.